Pallas Kunaiyi-Akpanah navigates the defense. The junior forward looks to pick up the first win of her career over Penn State on Wednesday. Northwestern is hungry for a win, and the clock is ticking. This past Sunday, the Wildcats (9-17, 2-10 Big Ten) dropped a game to Iowa (20-6, 8-5), losing by 9. 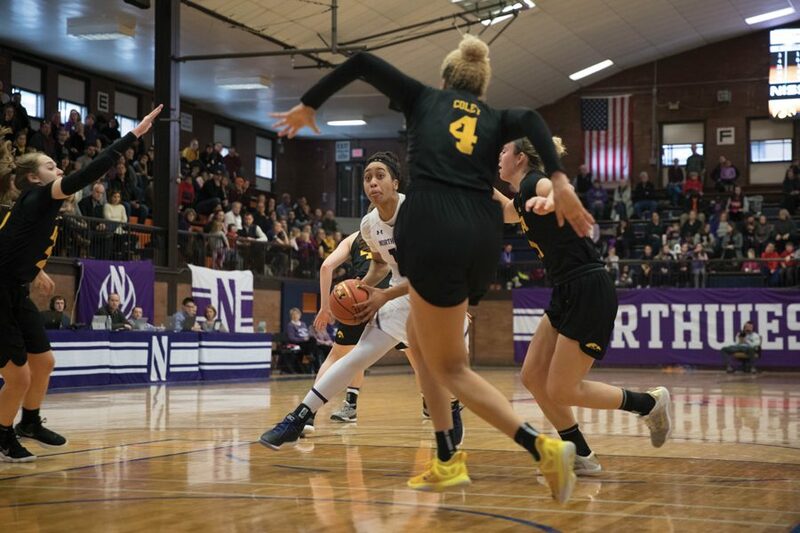 Close losses similar to that one are sprinkled throughout NU’s season, and with four games left, the Cats are looking to switch the narrative. Coach Joe McKeown said the team’s ultimate goal right now is to grab as many wins as possible. To achieve that objective, junior forward Pallas Kunaiyi-Akpanah said keeping team morale high is at the forefront of the their minds. “Better” is a loose term, but McKeown said, in the past few games, he’s seen specific improvements in the team’s play and hopes those improvements show on the court against this week’s competition. On Wednesday, NU will travel to Penn State (14-12, 5-8). Although the Nittany Lions sit just barely above NU in the Big Ten standings, Penn State has seen more conference success, snagging five Big Ten wins. McKeown said in order to top the Nittany Lions, his team needs to bring all the pieces together. To post a win against Penn State, the Cats will need key contributors to step up — specifically their freshman guard duo. Jordan Hamilton averages 8 points per game, while Lindsey Pulliam sits at the top of the leaderboard with an average of 14.8 points per game. Penn State will step onto the court sitting sixth in the Big Ten in terms of scoring offense. NU, conversely, stands at 11th. A key contributor on the Nittany Lions’ roster is guard Teniya Page, who currently ranks fifth in the Big Ten in scoring. With that being said, Kunaiyi-Akpanah said that if the Cats want to top Penn State, they’ll need to walk in with confidence.